WE REALLY SHOULD GET CHANGED AND GO TO OUR EXHIBITION SITE (which opens in 2 hours!! ), BUT WE CAN’T RESIST STEALING A GLANCE AT THIS BOOK. In a couple of hours, a group show that we are participating in will open. We really should get changed and get our fatar*sses moving to Nondon Bridge. However, we simply cannot resist taking a peek at this new book that we have just ordered through the library. There are 20 other books we are reading / supposed to be reading at the same time, and which take higher priority. In addition, we have been ‘saving’ this book for our tiny little sojourn this weekend out of Nondon (We have been meaning to get out of Nondon, and although now there are 56,000 compelling reasons stop us from taking a break, we are forcing ourselves to do so, and take up one of your suggestions of a day out [THANK YOU!! ], but trying to make us feel less guilty by also doing some work while we play). Once we landed our hands on Running and Philosophy – A Marathon For The Mind (ed. Michael W Austin 2007, Blackwell Publishing Ltd), we wanted to read it all at a go. 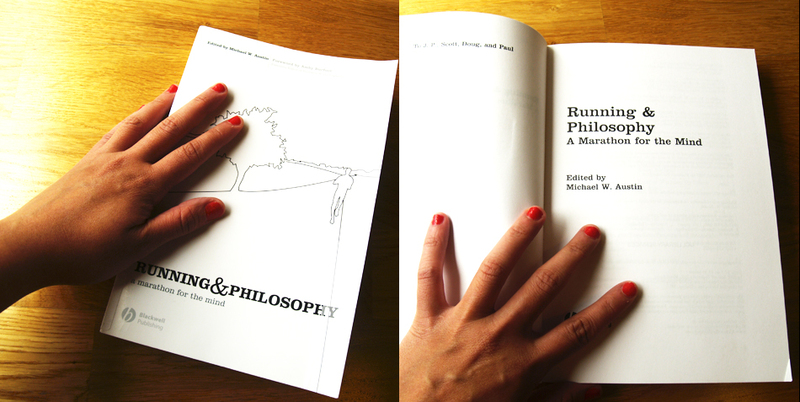 This is a collection of writings about the relationship between running and philosophy, by philosophers who run. (YES THEY EXIST. AGAIN, FOR THOSE OF YOU FLABBY ACADEMIC SNOBS WHO RUBBISH RUNNING AS UNTHINKING AND SAY WALKING IS MORE CONTEMPLATIVE, POETIC ETC ETC – wait till you read this book – and indeed OUR BOOK, later. Sooner. Some day. Just you wait, fatty). And as transient beings ourselves (with 750 days left on our life/death sentence) we know only too well about seizing the moment, enjoying the pleasures of pleasure while it lasts, etc etc. However, we also tried to delay this, with the reasoning (we are rational beings as well, you know) that a prolongation/holding back/delay of a pleasure will increase it infinitely, when it does come (also simply due to the accentuation of the pain of waiting/longing/desiring). Ah, the chaosmos of pain vs pleasure. As usual. Just now, we cheated a little. (Ah, the chaosmos reason vs desire. As usual). We plunged into the middle (as usual, rather than from the beginning – linearity is not the non-linear trans-dimensional runner‘s cup of tea), and read snippets here and there. And there and there. And a bit more there, and over there there, too. It is assuring a glance (or a few glances) – we have been writing a good, usable 18,000 words in the past 2 months (and 100,000 more that may never ever see any light – and we are not talking about writing from this amazing travel blog). It is useful at this point to read something that articulates what we have been saying or meaning to say (for reasons including that of copyright, we are not able to share with you that other kind of -equally if not more brilliant – writing of ours, at this point, though we would, later) . Also, our running for the week has been rather rubbish, due to pain in the knee, the tendon… -something or other area, and a burning sensation on our feet, and general pain in the ar*e, real, imagined, or rhetorical. Reading about the running philosophers who talk about pain reminds us to stop being sissies and get moving. This entry was posted on Thursday, August 19th, 2010 at 15:23	and is filed under GETTING THERE (ISH), POINTS OF DEPARTURE and tagged with happiness, mind over matter, run. You can follow any responses to this entry through the RSS 2.0 feed. You can leave a response, or trackback from your own site.